He’s the hero Chiba deserves… And the one it has right now. 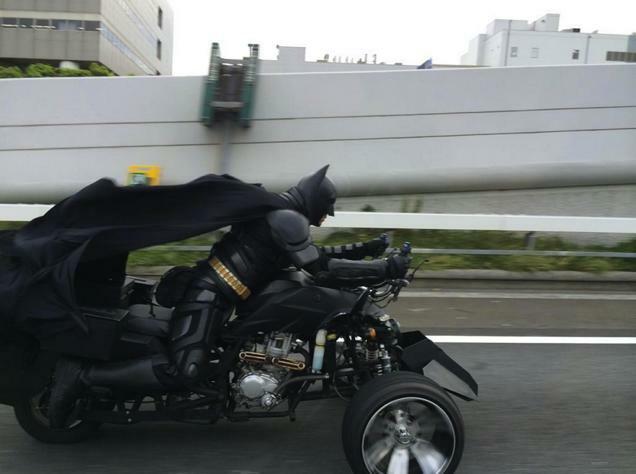 Seen in that prefecture of Japan that’s just east of Tokyo, a Japanese man lives out his dream of being The Caped Crusader, dressing up in the batsuit seen in Christopher Nolan’s Dark Knight films and mounting on his customized “Batpod” to cruise the streets to. If that wasn’t a fashion statement in itself, it certainly is a badass way to be heroic to the public! According to the report by Kotaku, the man being popularly referred to by the interwebz as “Chibatman” has become quite the sight, and his presence has been captured by numerous photos and videos as a result. Behind the cape and cowl however is a 41-year old welder by trade, who wears his costume not only as for the heck of it, but to ACTUALLY COMMUTE TO WORK on his trusty “ChiBatPod” – a customized trike that’s modeled and ridden almost the same way Christian Bale’s alter ego rides his two-wheeled vehicle in the movies! And here is the actual Japanese feature and video featuring The Caped Chiba Crusader himself! ChiBatman FeatureOne video capturing Chibatman in action has been edited to incorporate one of the musical scores for “Batman: The Animated Series“. To say it fits like a glove is a total understatement, and it just needs to be viewed for the epicness it presents! ChiBatman (Batman: TAS Music)While Chibatman’s “BatPod” has three wheels instead of two, there is a very appropriate explanation for this. 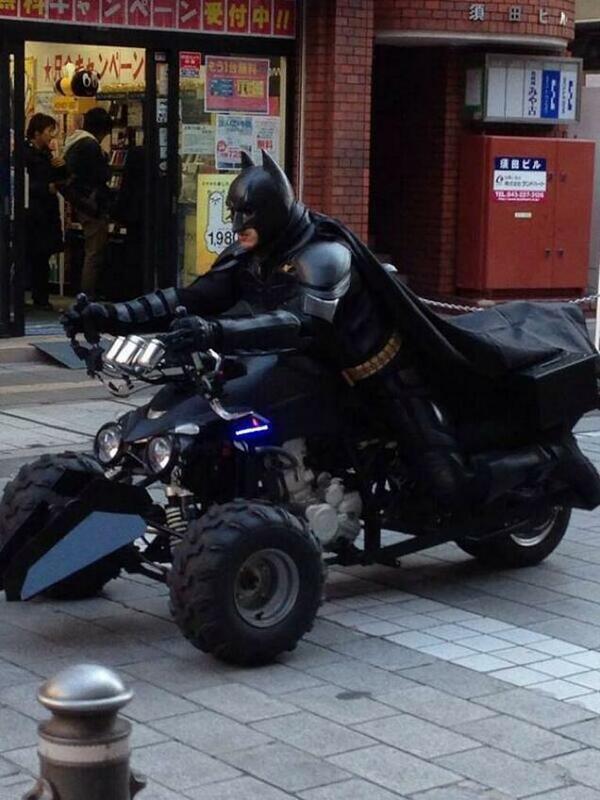 Since it technically isn’t a motorcycle, Japan’s vehicle laws allow Trike riders not to use helmets. As a custom job he made himself, that’s a pretty slick ride he’s got there, and the cape effect still works to great detail just like in The Dark Knight Trilogy! Why does he do it? According to ChiBatman himself from a Japanese interview – “I do it because I want to see everybody smile“. That is the silent guardian and watchful protector Japan has, and it’s pretty lucky to get it too, especially on the year of Batman’s 75th Anniversary!